Brown Paper Packages: Digital Scrapbooking?? Well, I really never thought I'd see the day when I was scrapbooking on the computer! I've just been playing with My Digital Studio and I absolutely love it! Of course I jumped right in and started fiddling around and I haven't even read the instructions or help manual...but I am sooooo excited with this page I created and I can't believe how easy it was!! Maybe, just maybe I can finally get some scrapping done! I am sure that I can't totally give up my actual papers, stamps, ink and other goodies, but I can still add elements to the pages I print out. I won't add anything to this page because I love it just the way it is. I love how this program (MDS) comes with so many stamps, papers, embellishments and I can use any fonts that are on my computer (believe me when I say that I have tons of fonts!!) LOL! I took this picture from our front porch last winter. We had so much snow, it was really unbelievable! We just kept shoveling and shoveling...but it was pretty. 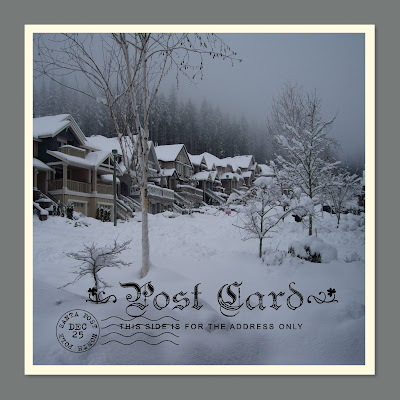 I added the script from the stamp set Winter Post and I resized it to make it fit on my digital 8" x 8" page. I can see that I'm going to have so much fun with this program over the holidays....I have so many pictures on my computer and now I can scrapbook from my laptop with my feet up and the fire on! How cozy is that!! I hope you enjoy this picture of last years snowy view. I really hope it doesn't snow this year! LOL!! That is so pretty - I would love to have it in my scrapbook.